We’ve talked about what doesn’t work when it comes to activating bike share, but it’s important to also highlight what residents are looking for — namely low-cost, low-liability bike share. The findings are part of recent study results by Portland State University’s Transportation Research and Education Center. 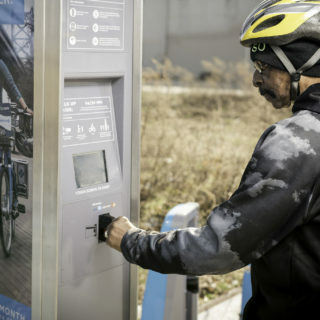 The study surveyed residents of Philadelphia, Chicago, and Brooklyn to learn about barriers and incentivizing factors for using bike share. 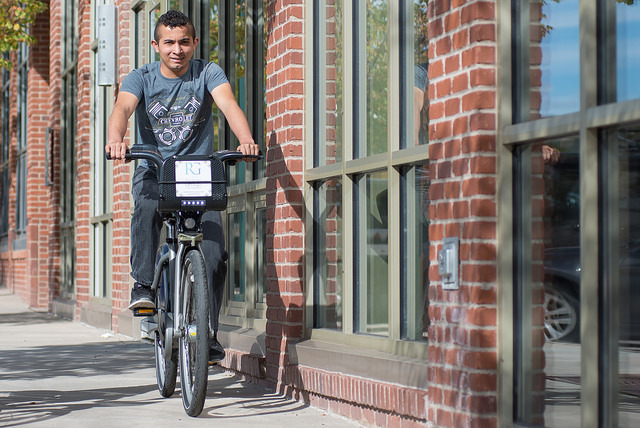 PSU researchers found cost to be one of the biggest deterrents to using bike share among low-income people of color. 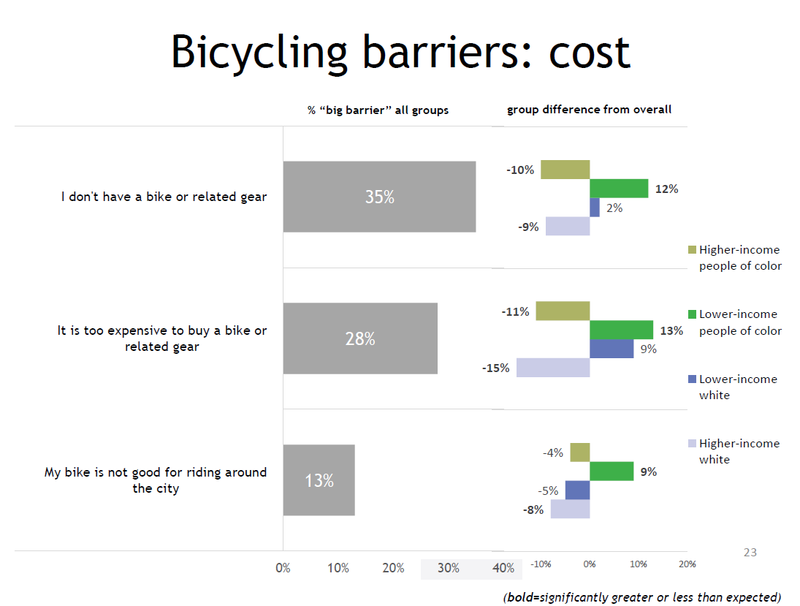 In fact, cost was viewed as a deterrent even to using a non-bike share bicycle, since many residents cited the lack or expense of bike gear as a barrier to cycling. 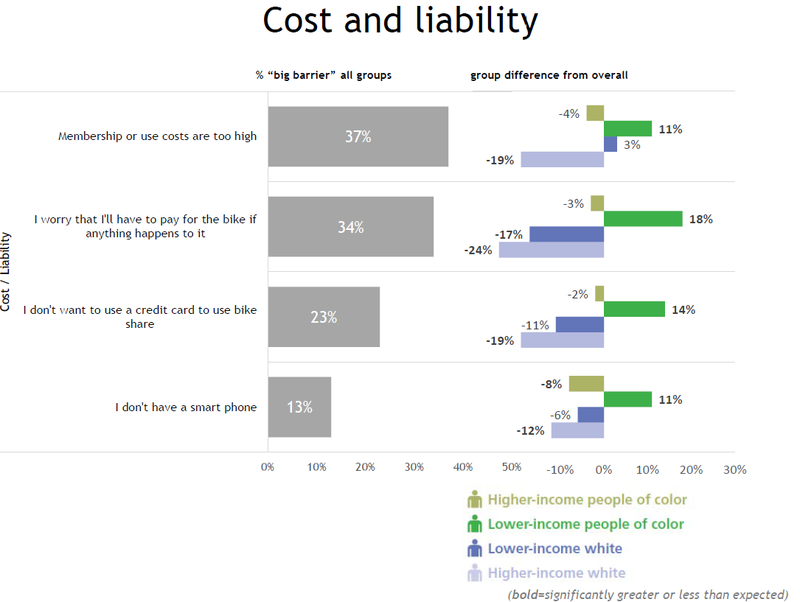 When it comes to bike share itself, low-income people of color were more likely than other groups to say that the cost of a membership was prohibitive to their use of a system. It is also important to note concerns around perceptions of liability for bike share, as over a third of all survey respondents thought that they might have to pay for a bike if something happened to it. This concern was even more prevalent among low-income residents of color. Fortunately, some changes to the way that bike share systems operate and market their requirements could make all the difference. As seen in an earlier graphic, nearly a quarter of survey respondents saw the credit card requirements as a deterrent to using bike share. Additionally, a greater percentage of low-income people of color, when compared to other demographics, saw credit card requirements as a barrier. 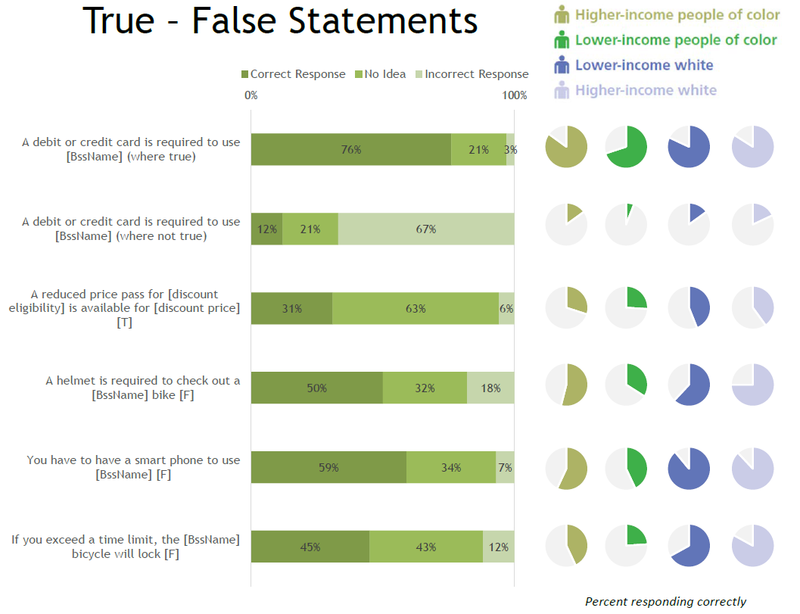 Interestingly, the concern over providing credit or debit card information was shared by more than just individuals with the lowest incomes. “Even higher-income people of color were less likely to want to use a credit or debit card to access bikes,” said McNeil. That means cash payment options are important for introducing users of all demographics to bike share. Which means that it is all the more alarming that two-thirds of respondents whose systems do not require the use of a debit or credit card incorrectly thought that they did need one to use bike share. 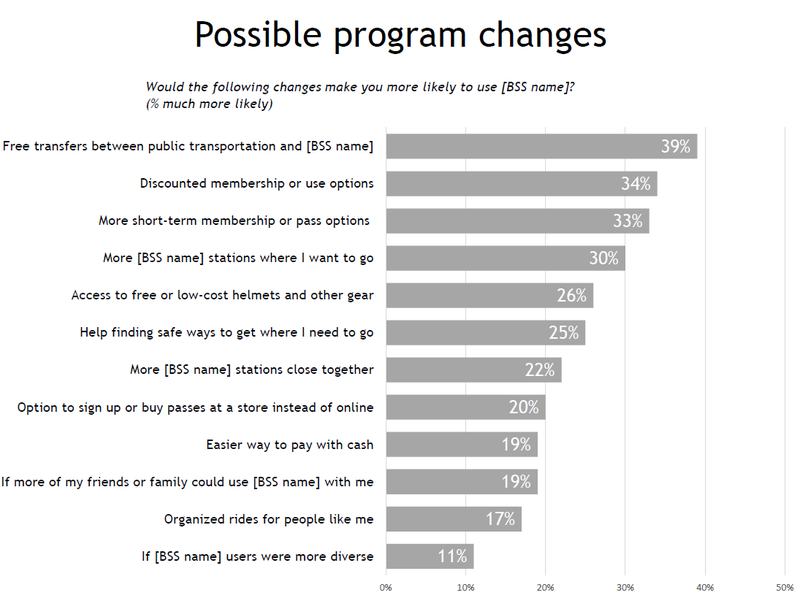 When asked about what incentives would make residents more likely to use bike share, the most popular response was free transfers between bike share and public transportation. 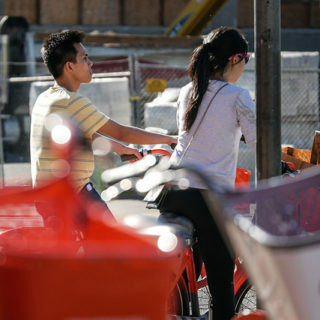 This finding suggests that connectivity to existing transportation options is important, and reiterates the role that cost plays in decisions to use or not use bike share. 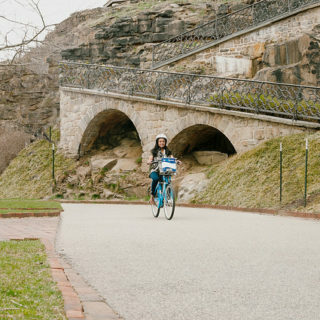 Other factors that were high on the list of positive factors included discounts, more short-term membership options, and access to free or low-cost helmets and other bike gear.